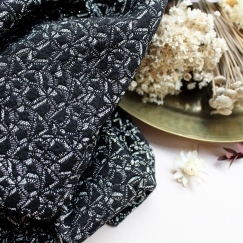 Our Atelier Brunette jacquard fabrics is both thick yet flexible. This made in France fabric is ideal for creating jackets, skirts, dresses and evening accessories. Made of cotton, polyester and lurex threads, the Atelier Brunette jacquard fabric with quilted and reversible patterns enhances your outfits for chic and glamorous parties. You will also find an entire range of essential items that will compliment your sewing creations Atelier Brunette’s haberdashery collection.